In 1993, a Cryptosporidium outbreak struck the city of Milwaukee, resulting in more than 400,000 illnesses and the deaths of 100 people. Since the outbreak, increased attention has been given to issues of water quality and protection from Cryptosporidium. The city of Cudahy, just south of Milwaukee, was heavily influenced by these issues when deciding on a water treatment approach. Cudahy’s source water enters from one of two surface water intakes located in southwestern Lake Michigan. Treatment includes chemical flocculation to remove larger contaminants through physical sedimentation; filtration to remove smaller contaminants; and chlorination to inactivate microbial contaminants. Cudahy’s source water is susceptible to contamination and significantly impacted by local factors, such as agricultural and urban runoff. Smaller cities face the challenge of balancing costs with the need to provide a safer drinking water supply. 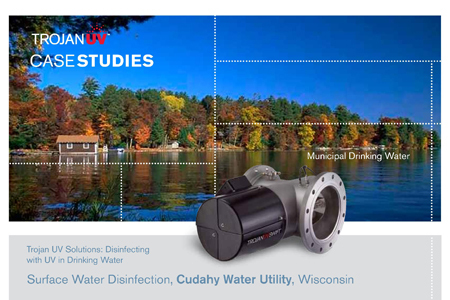 The Cudahy Water Utility Commission looked at treatments such as microfiltration, ozone disinfection and UV disinfection and assessed each for cost and performance. The low operational and installation costs of UV disinfection proved the most cost-effective solution while providing a proven barrier against Cryptosporidium.